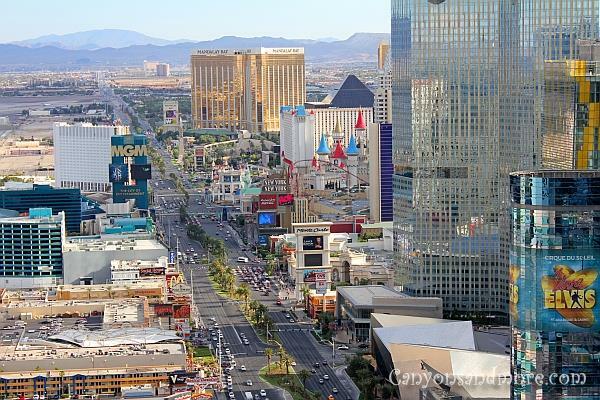 Las Vegas is an incredible city to go if you are looking for a place where boredom is a foreign word. Each hotel is an attraction in itself and there are so many other highlights to see and do. Because of its location in the desert, Las Vegas can be extremely hot, especially during the summer. That makes strolling through the different hotels a pleasure during the day. All along the strip there are also clubs, restaurants, shops and other highlights to visit. There is no getting bored in this city. During the day, Las Vegas looks great. But at night, it looks its best. The night life in Las Vegas has so much to offer! It is hard to choose what to do first. All the highlights and attractions are well lit up and begging to be seen and visited. Of course, when in Vegas do as the tourists do and try your luck at one of the many hotel casinos. Each hotel is actually an attraction in itself and is totally decorated in a particular theme. Hotels such as New York, New York, Paris, The Venetian, Mandalay Bay, Ceasar’s Palace, Casino Royale, The Luxor, MGM Grand and The Bellagio are just a few of the many theme hotels you will find on and around the Las Vegas Boulevard, otherwise known as “The Strip”. Each hotel has a unique theme and the idea is carried on through the inside. Once inside you will normally also find a casino and a shopping complex. The image above was made at Las Vegas Boulevard or otherwise known as the “Strip” taken from the “Eifel Tower” of the Paris Paris Hotel. It offers the possibility to see the city from above and from close up. Looking in this direction, you can see for example, the MGM, the Mandalay Bay, the Luxor, New York New York, Excalibur and the Monte Carlo amongst other hotels that are located here. Who does not recognize this sign? 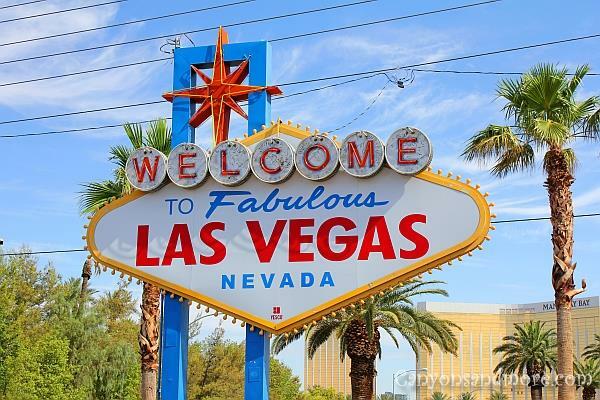 Did you know that this is not the only “Welcome to Las Vegas Sign? On our first trip to Las Vegas, we did not come upon this sign. Instead, we found another one located in the city and mistakingly thought THAT was the famous sign. But somehow it did not look like the sign we always have seen in pictures. On our second trip to the city, we set out and looked for this sign and finally found it. Bella Italia! Vanish into this hotel for a feeling of Italian flair. Not only can tourists shop and play games here but also can, as in Venice, travel in gondolas through canals. 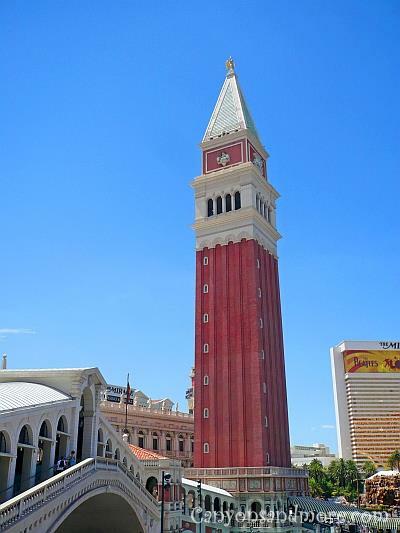 The inside of the Venetian was elegant, chic and traditional. It is like going through a trail of luxurious Italian architecture and arts. Viva la France! 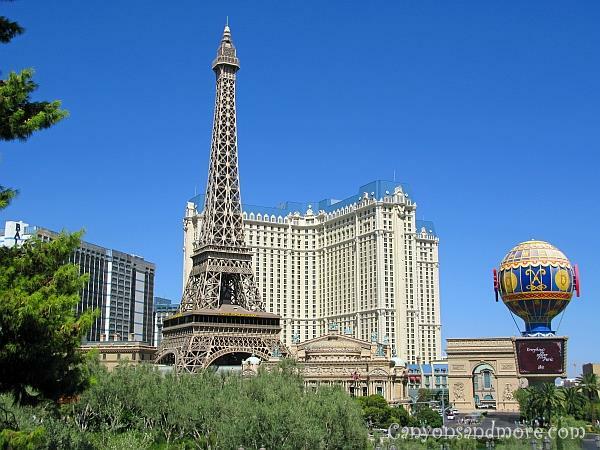 Even in Vegas the Eiffel Tower dominates the city skyline. This half scale exact reproduction is 460 feet high and has elevators inside to bring visitors up to the top for a breathtaking view of Vegas. The Paris Hotel highlights are definately a must see in the dark. When on the strip, they cannot be missed. 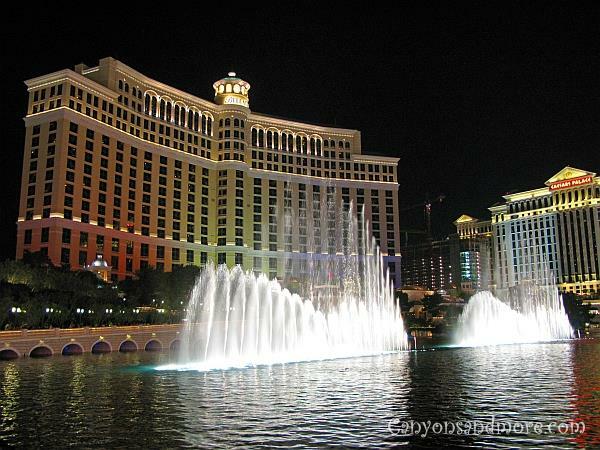 One popular attraction is the fountain in front of the Bellagio Hotel. Every 15 minutes the fountain perfoms a water show to music such as “Viva Las Vegas” from Elvis. Inside the Bellagio Hotel has a light and airy appearance to it. It is innocent, free and cheerful. It is like a child’s world full of colors and balloons. The highlights of the “Big Apple” smack in the middle of Vegas. While outside of the New York, New York Hotel you can choose to ride the roller coaster attraction. On the inside of the hotel, there is a casino and shopping possibilities. It actually feels like you are walking through some Brooklyn street and heading towards the next café. 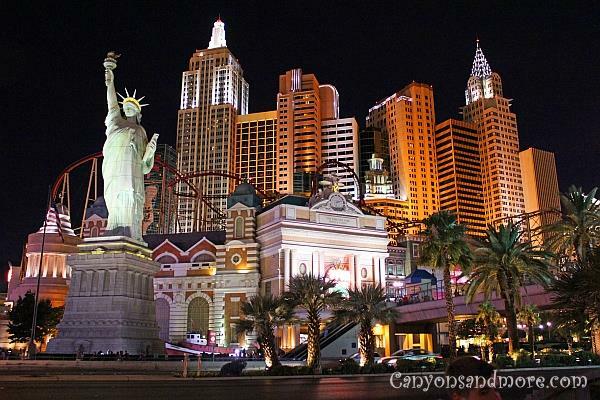 In front of the hotel New York, New York is the Statue of Liberty to welcome visitors to this complex. She is not as large as the real Miss Liberty in New York City but is quite impressive just the same. During the day, Las Vegas looks great. But at night, it looks its best. The night life in Las Vegas has so much to offer and it is hard to choose what to do first. All the highlights and attractions are well lit up and begging to be seen and visited. Of course, when in Vegas you can do as the tourists do and try your luck at one of the many hotel casinos. The image shows a compact version of the “Manhattan Skyline” at night. The Empire State Building and the Chrysler Building are easily recognized from this point. 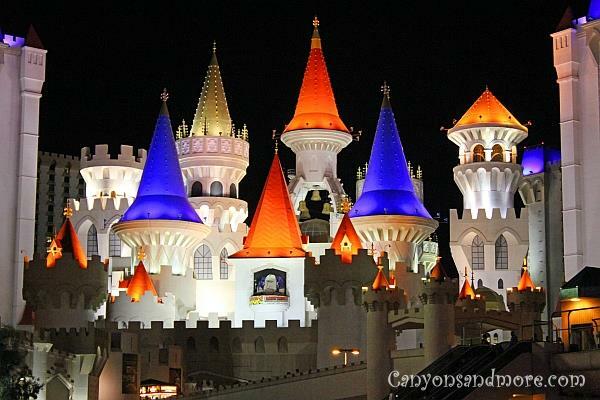 If the middle ages are your interest, the Excalibur Hotel is built like a castle and is located between the Luxor pyramid and the New York, New York Hotel. It almost looks like Disneyland. 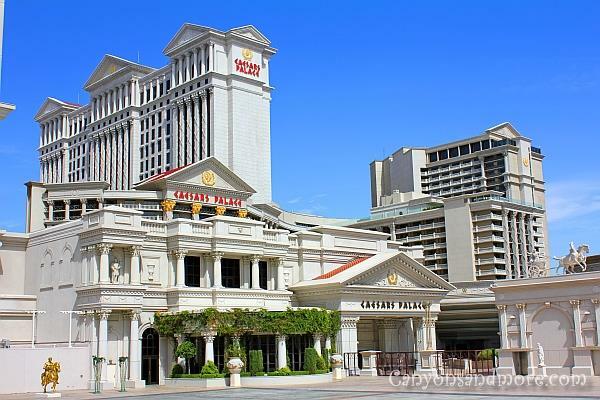 Ceasar’s Palace is a huge complex and takes one back in time to ancient Rome.The emperor himself would have felt at home in this hotel. This hotel takes your into an exclusive world of Roman history, culture and artifacts. The shopping area gives you a feeling as if you are outdoors somewhere in Rome due to the painted and lit up ceiling and the way the shops are designed. 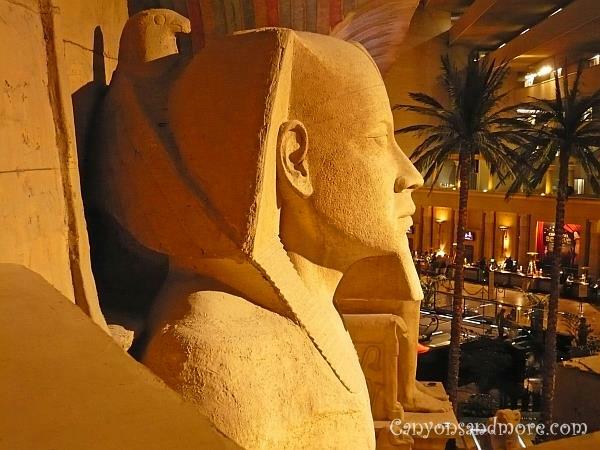 Egypt is the theme in the Luxor. That seems obvious when standing in front of the pyramid shaped complex. Entering it is like emerging into the world of the pharoahs. When standing inside, the doors to the rooms are visible and they go all the way to the top of the pyramid. 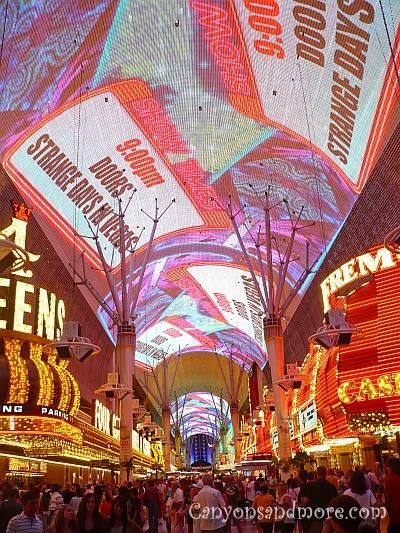 The Fremont Street Experience is quite a distance from the Las Vegas Strip but is worth the visit. It can be reached by car or using the tram/bus connections provided by the city. This covered tunnel like dome area is about 450 meters long and in it you will find casinos, souvenior shops, restaurants and stages. You will most likely see imitators of actors/ actresses or singers strolling around waiting to make pictures or different artists trying to attract tourists to their shows. The ceiling of the Fremont Street Experience is a real attraction. Videos of colorful advertisements, designs and images are constantly being displayed, which is already interesting to look at.